day. But this was not that day. traditional tortilla flipping, I didn’t have my mom’s cheat’s pan either. So I had to make do with this. quite like a spicy breakfast. onions have taken on a burnished hue. patient and toss the potatoes occasionally so they don’t scorch. layer of bubbles appears on the surface. Like this. oil if the pan is dry. – Add the eggs to the pan. As the bottom sets, push the sides of the egg a bit so the uncooked egg runs underneath. few seconds more then transfer to a plate. Drizzle with sriracha and enjoy immediately. makes the perfect hearty breakfast for one. breakfast can be just what the doctor ordered. I love tortilla. Nice cheats version Joey. 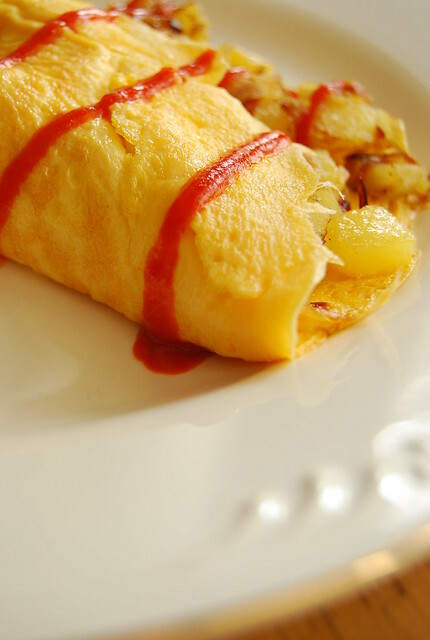 Oh but you do say it just right: potato and Sriracha! A perfect Cheat! Hi Tanna! I think potato takes so well to spice! Hi Midge! I use tinned liver spread to thicken the sauce of our adobo sometimes…my hubby loves it! Thanks for the great ideas! I definitely want to start cooking with potatoes more. Last night I made a similar omelet! I cooked the onions then put them into the egg, threw in a slice of provolone, then added some sliced avocado before closing the omelet. It was delicious and topped it off with some Tabasco (ran out of Sriracha, haha). I'm going to try this one out soon! I wish I had one of those cheat pans! I never succeed in flipping my tortilla without some sort of disaster and this also looks delicious! Hi Simone! The cheat pan is great…my mom's tortillas always look so perfect for it! I want a cheating pan too!! I know it's cheating, but it seems easier, right? Everything tastes better with Sriracha.